Registrations are now open for the official 2019 Tree Jumper Exhibition and Competition as part of the Jumpers and Jazz in July Festival from 18 to 28 July. 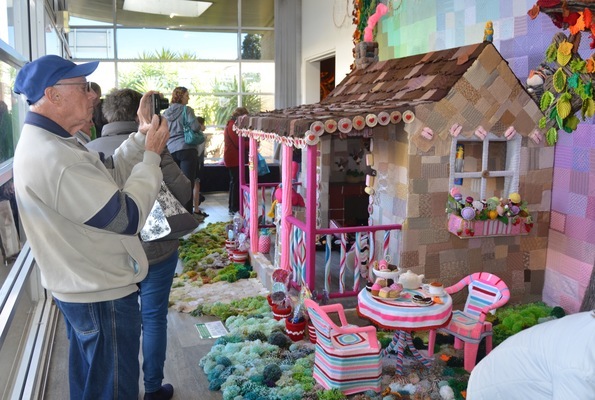 Warwick Art Gallery proudly manages the yarn-bombed tree jumper which transforms the CBD into an outdoor art gallery with trees ‘dressed’ in charming textile artwork. Anyone can participate, with entries coming from near and far each year that are flamboyant, colourful, heart-warming and often comical. This year’s tree jumper theme is ‘CONNECT’. Announcement of the winners of the yarn-bombed tree jumper competition will take place at ‘Jazz @ the Gallery’ (Warwick Art Gallery) on Saturday 20 July at midday – a free event in the garden outside the gallery for a day focussed on celebrating artists and yarnbombing. No specified theme or set materials. knitting or crochet or a combination of both. This award will be presented to an entrant who has excelled in the art of yarn bombed tree jumper creation. Not for profit community groups and schools will be eligible for this award when they tick the box on the entry form. Tree Jumper Exhibition judges for 2019 will be Brisbane textile artists Kate Oszko and Helen McIntosh.